Reno dad, Jason Lintner, has an arsenal of NERF guns in his house (well, let’s say they’re his son’s). If you’re like me, you know that management of these toys is usually difficult – they’re either scattered across the house or piled in a box somewhere. 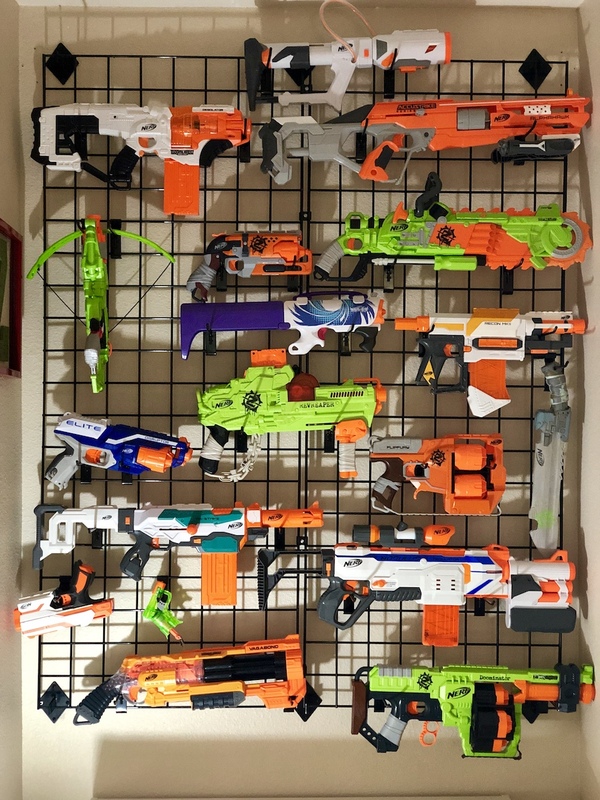 So, Jason decided to build a NERF gun wall in his house to not only showcase the collection (this holds 18 guns), but to keep them organized (bonus: he surprised his son with the project). Jason was generous enough to share with us the pieces he used to build the wall, and a little instruction for how to build your own. Full disclosure: Jason’s wife found the idea online, but that doesn’t make it any less rad. Jason purchased his materials from Store Supply Warehouse in Sparks (860 E. Glendale Ave, near Summit Racing). You can, of course, make the wall whatever size works for you, but this is what Jason did. Locate a wall that is easy for kids to access. Consider the height of your kids and what they can reach. Determine the amount of wall grid paneling you want to use (the panels in this article are 2′ x 5′), then with the wire grid panel connectors adjoin the panels you’re using (tighten down). Locate studs in the wall for the wall mounts, if possible. If not, you can purchase a special sheetrock screw (pictured above). You’re going to have a fair amount of weight hanging, so you want to make sure the rack is secure to the wall. Attaching directly to studs is ideal. Mount the wall bracket allowing the brackets to have the grid panel rest on the top brackets. Install the top brackets first and make sure they are level. Continue mounting brackets to the wall evenly spaced to distribute the weight. Your rack is now installed, and you can place the peg hooks to fit your arsenal. There are multiple sizes available. Each gun generally requires two hooks to hang them the way pictured. You could also hang some from the trigger guard. You can also attach hanging baskets for accessories or holding darts.